It’s been an incredible year of releases, but the triple-A landscape is always a homogenous one. They thrive on mass appeal, which means they rarely focus or obsess over a single element. 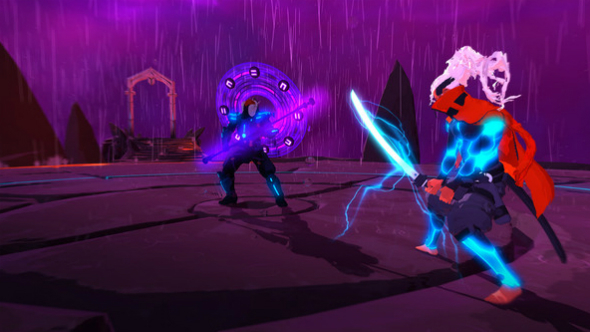 Furi, meanwhile, is all about repetition and perfection: it’s a game with nine bosses, four moves and absolutely no progression, stat-improvement or ability unlocking. From start to finish you can only shoot, dodge, slash and parry – moves you’ll have to time to perfection if you want to see the game through to its end. It’s the most difficult game I’ve ever played, but it’s also one of the most rewarding, offering up greater gaming highs than the Souls franchise without forcing you to stomach half as much frustration. Looking more of this year’s finest? Check out the best PC games of 2016. The game’s premise is just as singular. You play as a prisoner called Rider – essentially a neon-infused Rōnin with an energy pistol. After being freed by a mysterious rabbit-headed figure, you embark on a quest across a series of prison islands suspended above Earth, each one housing a new guardian for you to defeat. Where Furi really excels is in how fresh it manages to make every boss fight feel with so few mechanics at play. Rather than each boss being defined by their skill set, they’re defined by a rhythm and motif. The Song, for example, is an attritional boss that pelts you with wave attacks and bullet hell phases, letting you constantly deal damage with your pistol but only forfeiting the whole of her health bar if you can outlast her suffocating array of projectiles. Immediately after slaying her you’ll go up against The Burst, a boss that you’ll have to hunt down in an enormous, maze-like arena and can remove one of your health bars with a single, largely unannounced shot from the shadows. Instead of calmly weaving between an endless barrage of death like you did against The Song, The Burst demands that you take the initiative, forcing you to sprint around the map hunting down your opponent, keeping track of any cover in case you spot her laser sight focussing in on you. 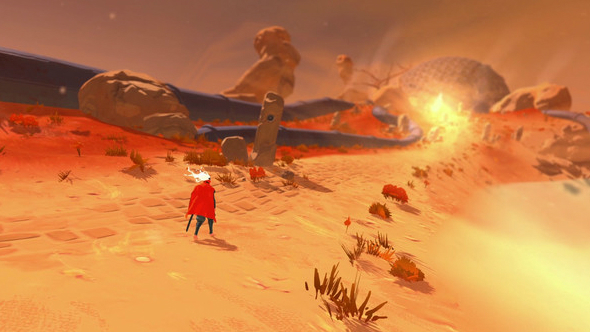 Furi’s boss fights rarely stray from the same format – they’re mechanically repetitive, but each one feels distinctive. 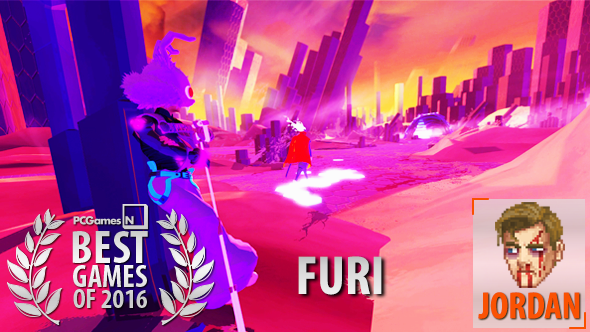 Much like the layered beats and sequences of the electronic soundtrack that backs every bout, Furi revels in the subtle differences between every phase. 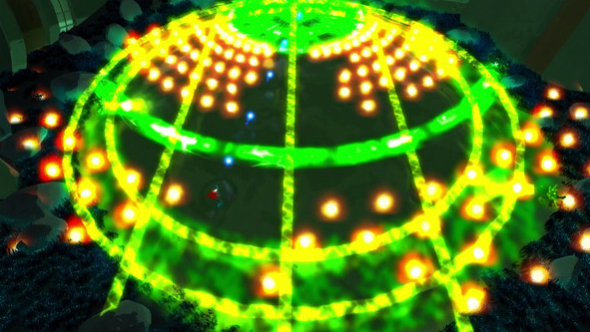 Combat patterns loop over one another, escalating in difficulty, and by virtue of Furi’s visual telegraphs, in aesthetic impact too. Attacks morph and change over the course of each brawl, sometimes becoming more ferocious and unpredictable, forcing you to play reactively, other times taking on a predictability that can only be conquered by a clear mind. Furi also pits you against opponents that are the same size as you, an important detail that’s reflected in the gameplay. Unlike in the Souls series, you’re not forced to go up against a towering demon that can kill you in a single, inconspicuous grab attack – every combatant you face off against is your equal, in terms of both size and damage output. Likewise, every attack is clearly signalled, ensuring that you don’t waste a single second trying to guess what’s about to happen. It’s the age-old ‘tough but fair’ maxim turned up to eleven and devoid of any workaround. There is an easy difficulty setting, but once you switch to it there’s no turning back, which removes any temptation to lower the difficulty for just one boss fight. It does mean anyone can see out the game’s story, though. And that narrative is probably Furi’s greatest surprise – because seriously, who in their right mind expected a compelling revenge yarn from a game with a typo in its title? Each fight moves the narrative forward, eventually turning what at first appears to be a simple tale of revenge into a nuanced exploration of purpose and agency. Taking on a knight in the presence of his toddler son, turning down an offer of peace and relative freedom, pursuing a Guardian who begs for mercy – it’s not long before you realise that you’re not the good guy. Fights are bookended by four-minute walking segments, where you march towards the next encounter across a new slice of surreal terrain, your bunny-headed cornerman whispering bitterness in your ears and the surging beat of a new electro track amping up the excitement to feverish levels. These segments provide a safe space to explore the lore of Furi’s world, they offer solace and a chance to put your gamepad down (you can automate the walk) – they’re the cutman in a boxing match, stepping in between each round to ice your wounds and lift you back up. It’s all over in less than ten hours, but for every last second I was hooked, and not enough games have made me feel that way this year. Furi’s systems and ethos chime with me, but there’s every chance that they won’t tick with you. Indie gaming often asks you to take a chance, and if you like Furi, that risk is rewarded with an unforgettable experience instead of yet another eight out of ten.